We are proud to be a small, agile team that does great work for our clients. Since we don’t always work together in the same place in an office sitting next to each other, we rely on some amazing tools to help us get our work done. We thought it would be a great thing to compile a list of these tools on this page. Please Note: some of the links below are partner links that allow us to earn a small commission if you purchase from them or sign up for a free trial. There is no additional cost to you for this, but in the interest of full disclosure, we just thought we’d let you know. We really do use these tools on a daily basis – and we absolutely only recommend tools here that we know and love. They hold a special place in our little marketing and design hearts! We often have clients and other colleagues ask us what the one tool is (if we could pick one) that we absolutely live or die by. You guessed it – it’s Basecamp. It’s the email killer, and it’s amazing. Basecamp allows you to organize each project into a clean, streamlined place in your account where you can message, share files, collaborate, upload and link documents, and more. Conversation takes place via comments on a message, rather than individual emails. We honestly can’t say enough about it. It’s just that amazing. If Basecamp ever went away we’re not sure what we would do. We hardly send emails any more! One of the coolest things about Basecamp is that it works for all kinds of organizations – not just businesses. It’s cost-effective enough to work for even churches or non profits, or really any kind of organization. We send people to Basecamp all the time to run their projects through it! If you check it out using the button here, they’ll give you (and us!) $50 in cash. If you’re still sending a ton of email to your team each day and emailing attachments back and forth until you want to cry, then get into Basecamp today. It’s by far our #1 “can’t live without” tool. As a digital web agency, we deal with web hosting companies a lot. When it comes to working with web hosting companies, we’ve seen it all. Hosting companies that we’ve worked with range from really great companies with fantastic support and features (but higher cost), to lower-cost offerings with horrendous support and a “hope you can figure it out” attitude toward the customer. As an agency, we develop all of our websites on WordPress. We love WordPress and our customers do too! 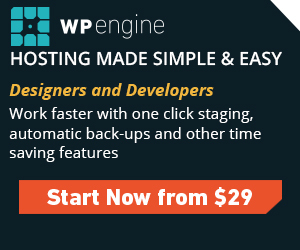 WP Engine is by far, the best partner we have worked with when it comes to managed WordPress hosting. Specifically, we love how they handle daily backups, allow us to stage and push sites live with one button, and how they partner with MaxCDN to help speed up our sites that we host for our clients. Customer Service is amazing, and that makes a huge difference. We have felt really well taken care of whenever we have reached out for service from WP Engine. When it comes to managed WordPress hosting, your quality choices are these guys and Media Temple, and we like these guys better. If you’re not using WordPress, or if you are and are just looking for more of a DIY, lower-cost web host, we recommend Dreamhost. Bottom line with these guys…you just can’t beat the value. For years, before we started developing exclusively on WordPress, we used Dreamhost for all of our web hosting needs as a company. If you are just starting out, you are probably confused as to which web host is best, and what features you need. What Dreamhost offers in their basic shared and VPS hosting packages is what you need! Their web panel is straightforward and easy to use, and they offer Live Chat support with a VPS (Virtual Private Server) and higher plans. At only $8.95/month, it’s a great value as long as you are knowledgeable to handle most security and other server issues yourself, or you have someone you can hire to help. Dreamhost does offer a managed WordPress hosting solution called DreamPress, which runs about $20/month and allows your WordPress site to run on their servers that have been optimized specifically for WordPress. This is by far one of our favorite tools to recommend. Almost anyone who is starting a business or has a team and needs branded email should consider using this suite of tools. First of all, G Suite will give you beautiful, branded @yourdomain.com email addresses for everyone in your organization, business, ministry, or really any group of people. This is paramount to presenting a professional business image to your potential and current clients. It says you know what you’re doing, and you are serious about your business. Secondly, like Gmail, the SPAM filters are out of this world. We love clean inboxes. We hardly ever deal with spam in our actual inboxes. G Suite comes with 30GB of online file storage for each user in your organization. Store company documents, collaborate with company spreadsheets, financial documents, mock-ups, whatever. Store it in the cloud and let everyone see and collaborate on it in real-time, from any device. Finally, everyone in your organization can also share a calendar, so you can see each other’s meetings and more. We love these tools, and we think you will too. Oh, and by the way…it’s only $4.17 per user per month ($50/user/year) if you pay for the year in advance. Pretty sweet deal. You can upgrade all users to UNLIMITED cloud storage (really) for just $5 more/user/month. As a distributed team, tracking each team members’ time is paramount to ensuring that we all stay productive. We use Time Doctor to track each team members’ time for each task that we work on. It helps keep us productive by capturing screen shots of our work. At the end of each day, week, or month, we can review the team’s time to ensure that we are working on things that can help us to continue to innovate for our clients. Time Doctor works and syncs on any device, including native Android and iPhone apps. You can Start Your 30 Day Free Trial by using the button to the right. We build about 95% of our websites on the WordPress platform for our clients. This allows clients to easily update their own websites without needing the outdated “Webmaster Services” retainers of yesterday. One of the main components of any websites, WordPress or not, is contact forms. Contact forms are used in many ways these days, including everything from email opt-ins to simple “Contact Us” forms. Although there are free plugins available to handle forms, we LOVE Gravity Forms. Gravity Forms is a very affordable form builder that was built for WordPress. It offers many features that Contact Form 7 and other free plugins do not offer. As an agency, we are able to use it on all of our client’s sites by utilizing the Developer License, which allows us to install the plugin on many different client sites and get annual updates and support. If you are a single site owner looking for a good form solution, this is the perfect solution. There are a TON of amazing add-ons that integrate with Gravity Forms as well, including add-ons for Stripe, MailChimp, Zapier, AWeber, Emma, Infusionsoft, and more. If you’d like to sign up, please use the button to the right to get started today! One of the most common questions we get from clients and potential clients is in regards to security of their website. WordPress is an extremely powerful platform that’s easy to use, but it also creates a potential security issues due to the fact that there are many different plugins, themes and even the WordPress core that has to be updated on a regular basis. Our team does an amazing job of helping our clients understand this process. With our sites hosted with WP Engine, we know that Sucuri is working in the background and is ready to scan any of our client’s sites that may get hacked. Depending on our current project load, we sometimes get requests from website owners that aren’t our clients to clean up their sites that have already been compromised. If we are too busy to step in quickly and help, we always send them to our friends at Sucuri. Sucuri, simply put, is a company that helps to clean and protect ANY website from malware attacks, DDoS attacks, and all types of malware and spam. They are amazing and we love them. We recommend that every single one of our clients use a service like Sucuri. The monthly cost (only about $16/month for Basic coverage) is WELL worth it to not have to spend the hours and money to clean up AFTER an attack happens. These guys will help with any website, WordPress-based or not. Check em out! As an official trusted Shopify partner, our team works with several different e-commerce merchants each year to design, build and develop both Shopify e-commerce stores and custom Shopify apps. For years we built sites on the Magento platform, but about 2 years ago we completely switched over and started building on and recommending the Shopify platform wholeheartedly. With a growing ecosystem of developers extending the platform, along with over 375,000 Shopify webs stores in existence, the platform is unrivaled when it comes to an affordable e-commerce solution. We recommend the Shopify platform with full confidence for the vast majority of small-to-medium sized e-commerce stores and businesses. SCREENSHOTS CAN WE GET AN “AMEN! !” Seriously – this tool has changed our lives! CloudApp installs on your computer and then allows you to quickly and easily take screenshots and screen videos (including audio if you want to narrate it with a microphone) of what’s going on on your screen. Now you might be wondering what our major use for this would be. We just signed up and had no idea how many different ways we would use it. We use it for client screenshots and tutorials (so like “here’s how you do this or that in your website”), software development (catching bugs and errors on screen), support and help articles (how to videos), walk-throughs, team communication, and more. Seriously this app is so ridiculously usable. It’s very affordably priced as well. The basic account starts at only $8 per month.